TSplus provides Multiple Sessions, Load Balancing, Universal Printer, Seamless Remote Application, Application Control, Secure RDP and much more without having to implement 2003/2008 TSE or Citrix. TSplus is the most cost-effective and easy-to-use alternative to Windows TSE or Citrix. 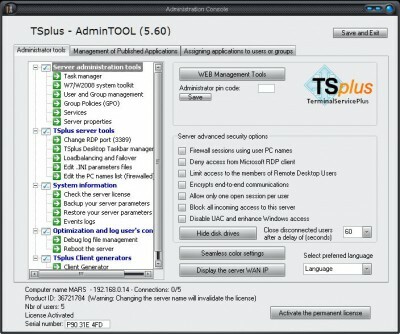 With TSplus you will Web-Enable instantly any of your Windows application. The Citrix ICA Macintosh Client is an ICA Clientdeveloped specifically for the Mac OS X operating system,providing native connectivity to MetaFrame servers for Macintosh users.